I’ve owned and loved this trinket dish for years now, and it’s still one of my favorite decorative accessories! It makes a darling inexpensive gift that any girl could use on her dresser, desk or bathroom counter! If you know someone who wears clutches out a lot, a card case like this one would be a perfect present. I have a similar one by Chanel from several years ago that I still use to this day – it’s the best for even the smallest bags! Plus, it’s pretty. Live somewhere chilly? Nothing like a luxurious pair of cashmere gloves to keep you cozy on the reg. These are under $70 and come in three classic colors! This is actually featured above, but I have to talk about it because the photo doesn’t really do it justice. This stunning bracelet doubles as an IPHONE CHARGER! How cool is that?! Great gift for the traveler or someone like me who is glued to their cell 24/7. Give the gift of long, thick lashes by stuffing a tube of NeuLash in her stocking. I’ve used it for over two years – it really works! I receive so many compliments, and this is the reason. Miracle product! I love Hanky Panky thongs – they’re my go-to undies and are so comfortable. This three-pack features fun colors in my favorite rise. The holiday package is just small enough to fit in any stocking! For the girl boss, gift her some pretty gold pens to place on her desk. In addition to being useful, they’ll add some sparkle and shine to her office space! These Les Bon Bon earrings are beautiful, lightweight and have been seen on every fashion “it” girl” this season. An investment to be sure, but they look great day or night and will become classics! A nice little luxury gift for the trendsetter in your family. Don’t want to spend that much? Check out BaubleBar’s version. I looooove receiving candles as gifts. For me, they are a necessary evil and I don’t always like buying them for myself – I say evil only because they can be pricey. For an intoxicating scent year-round, try this one by Le Labo – it’s a current favorite! Every girl can always use more lip gloss. It’s an easy product to throw on (even on the go! ), it’s inexpensive, and most of the shades work for every skin tone due to the sheer nature of (most of) them. My favorite lip gloss formula is actually about to be reformulated, so stock up and gift now before the colors are gone! My go-to’s are Wild Rose, Seashell and Blizzard. 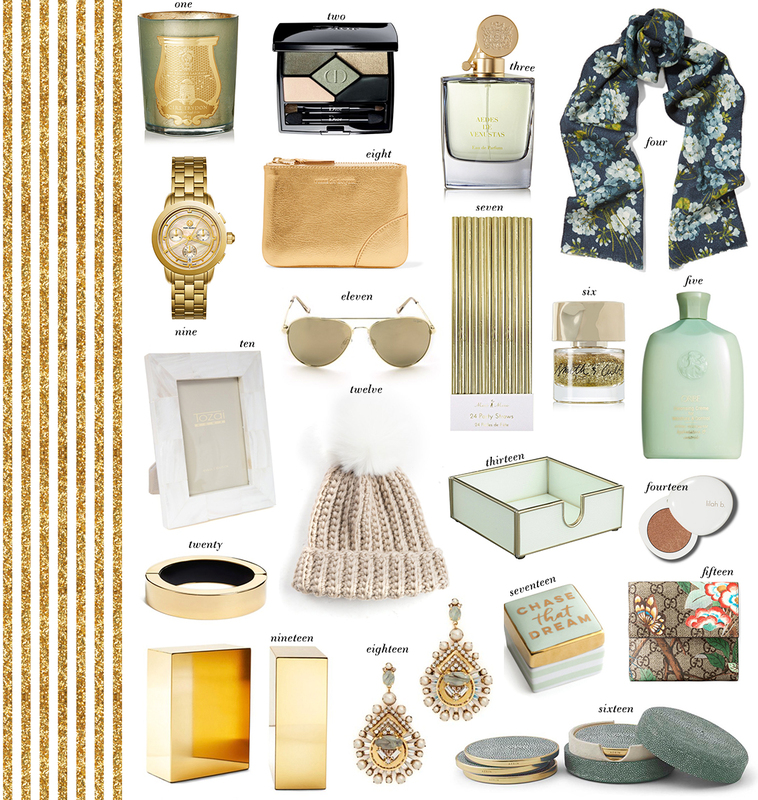 PS – don’t miss the rest of my holiday gift guides here!